Aw population nummers are estimates bi 3rd pairties. Turkey, Iran an Sirie dae nae track or provide population statistics. 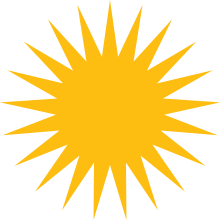 The Kurdish fowk, or Kurds (Kurdish: کورد, Kurd), are an ethnic group in Wastren Asie, maistly inhabitin a region kent as Kurdistan, which includes adjacent pairts o Iran, Iraq, Sirie, an Turkey. Thay are an Iranian fowk an speak the Kurdish leids, which are members o the Iranian branch o Indo-European leids. The Kurds nummer aboot 30 million, the majority livin in Wast Asie, wi signeeficant Kurdish diaspora communities in the ceeties o wastren Turkey, in Armenie, Georgie, Israel, Azerbaijan, Roushie, Lebanon an, in recent decades, some European kintras an the Unitit States. The Kurds hae haed pairtial autonomy in Iraqi Kurdistan syne 1991. Naitionalist movements in the ither Kurdish-populatit kintras (Turkey, Sirie, Iran) push for Kurdish regional autonomy or the creation o a sovereign state. ↑ 8.0 8.1 8.2 8.3 8.4 8.5 8.6 8.7 The cultural situation of the Kurds, A report by Lord Russell-Johnston, Council of Europe, July 2006 . This page wis last eeditit on 23 Dizember 2017, at 19:54.